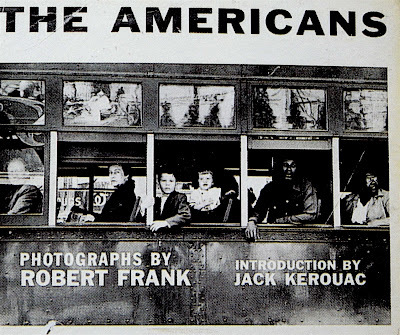 Bookride: Robert Frank. The Americans. Robert Frank. THE AMERICANS. Grove Press, NY 1959. Intro by Kerouac in his inimtable bop style - "...a sad poem sucked right out of America onto film, taking rank among the tragic poets of the world. 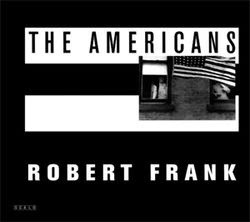 To Robert Frank I now give this message: You got eyes." The book resulted mainly from a car trip across America where Frank shot some 20,000 images on 687 rolls of film. From these he selected the 83 plates in the book. Some of the photos were used on the album cover of The Rolling Stones album Exile on Main Street giving the book further hip credentials. Frank also made a rockumentary about the Stones 1972 US tour - 'Cocksucker Blues.' Not esp scarce but hard to find a fresh copy as photo books tend to get handled and looked through. Preceded by a Paris edition in 1958 "Les Americains," which has text with the photos - this too is wanted and is potentially more valuable than the US edition. As Parr says, Frank's book was a healthy antidote to the bland sanctimony of photobooks of the time, like 'The Family of Man.' A review at the time in a popular photo mag said "...meaningless blur, grain, muddy exposures, drunken horizons and general sloppiness." It is claimed that the gravure plates in the original Grove first edition are far deeper and richer than the reproductions in subsequent reprints. RECENT VALUES / MAY 2007 The above was written in January 2007. Yesterday a nothing special but jacketed 1959 first made $4560 at Swann in NY with a similar Aperture edition bringing $780. This prompted me to look at 2006 auction records and the book, uninscribed but presumably fine in fine made just over $13000 twice at Swann. One of the copies was from the collection of Robert Bretz. High prices confer status and the book is now seen as the pinnacle of modern American photography. The French edition now makes about half the US edition's price but is still desirable. Both books have greatly improved in price in a year, the US edition having more than doubled.